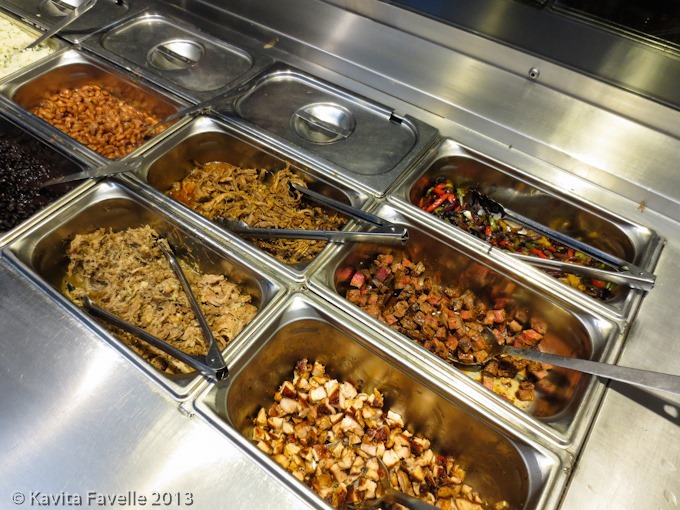 In just 20 years, American restaurant chain Chipotle Mexican Grill has grown from a single store in Denver, Colorado to a cross-country and international chain of over 1500 stores. 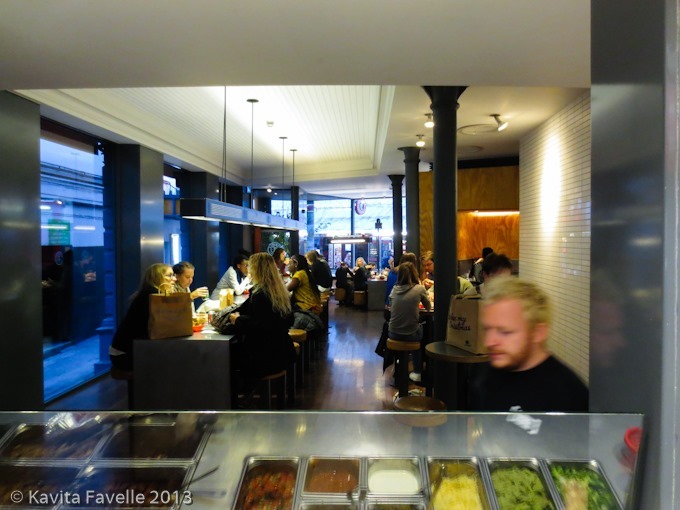 Founder and CEO Steve Ells spent some time in San Francisco (working at the highly respected Stars restaurant), during which he came to love the little taquerías he frequented in the city’s Mission district. 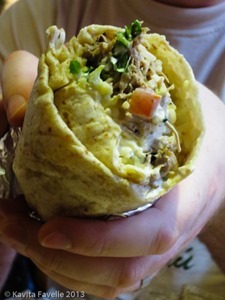 These Mexican taco shops fascinated Ells; in the video on the company’s American website he explains how taken he was by the freshly-made burritos with a range of ingredients (rice, meat, beans, sauces) wrapped up inside a giant tortilla; he’d never seen anything like these before. He decided this was the kind of restaurant he wanted to open himself, using authentic ingredients and adding his own style to the setting. 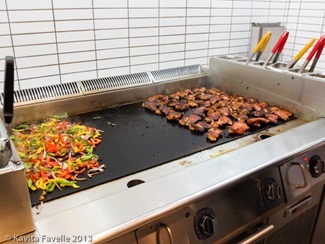 Of course, he also took note of the model of service in these little stores, where a small team of staff working along the length of a counter were able to serve a high volume of customers quickly and efficiently, understanding instinctively that it was a very economical way of running a restaurant. 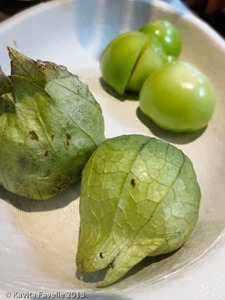 I was introduced to the brand early this summer, when asked if I’d like to visit Edible Ornamentals, the Bedfordshire chilli nursery who grow fresh tomatillos for Chipotle. (When they aren’t in season in the UK, Chipotle import from Spain, Netherlands, Portugal, and Mexico). Tomatillos are a key ingredient to authentic Mexican salsa but not an ingredient commonly grown in Europe, so Chipotle were very happy when Edible Ornamentals agreed they could grow and provide a UK supply. Pete and I loved visiting the nursery (and have since harvested lots of tomatillos from the pair of plants gifted to us by Joanna). 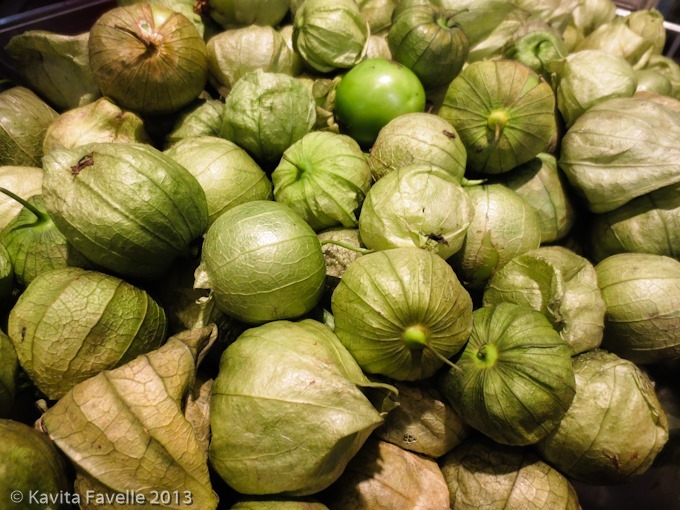 Some months later, once British-grown tomatillos were finally in season and available on the Chipotle menu, we made our visit to the restaurant itself. Manager Anna Czigany showed me around and her enthusiasm, not just for the product but for the company as an employer, was very genuine. She is very proud that the company values staff retention, gives on-the-job training and encourages career progression. She started as “crew” three years ago; likewise, many of her colleagues have been in the company for a 2 or more years and similarly appreciate advancement opportunities. After we ate, she took me round the kitchen, explaining where and how the various menu items were made. She pointed out that because every item on the menu is made by the small team of staff that run the branch, everyone knows just how each item should taste and they are more invested in making sure everything is as it should be; it’s not just a case of serving some food but taking pride in serving food they have created. Anna also told us about the company’s commitment to sourcing quality ingredients that are selected with the environment, animal welfare and customer health in mind. To this end, they use only Freedom Foods chicken, Farm Assured beef and Free range pork and buy vegetables and other produce from local farmers where possible. 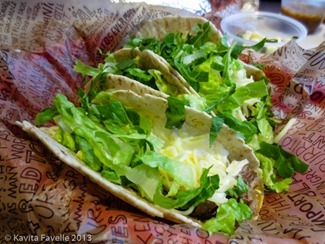 We tried both the burrito and a portion of tortilla tacos (with a different filling in each), which allowed us to try all four meat options. The chicken (£6.70 regardless of which format you choose) is marinated in adobo before being grilled and diced; it had a good flavour and was deftly cooked so it wasn’t dry; it also had the advantage of being less messy than the braised beef or pork. Steak (£6.95) is treated much like the chicken and was perfectly decent. Beef Barbacoa (£6.95) is braised and then shredded to create a delicious, sloppy mess; it was very good, though rather spicy for me, being the hottest of the four. And lastly, Pork Carnitas (£6.95) is also braised and shredded and is not disimilar to the beef, but has the advantage (for me) of less chilli heat; a winner! 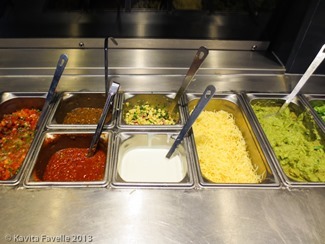 (The vegetarian option, which we didn’t try, is also priced at £6.50 for burrito, bowl, tacos or salad). 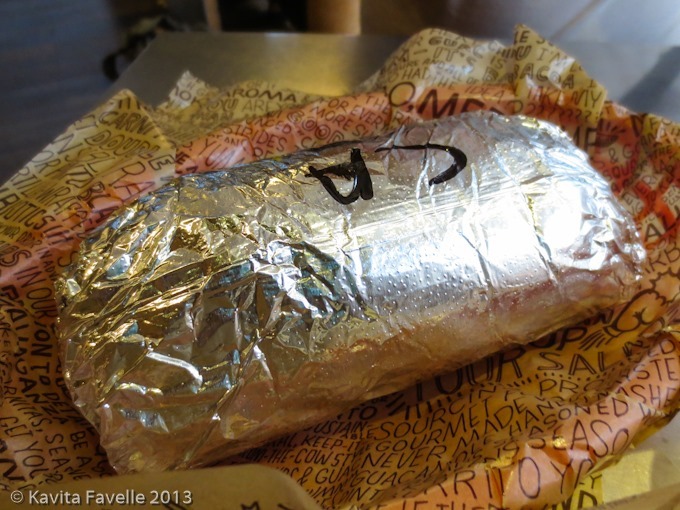 The burritos are enormous, by the way, so they are the best value for a quick and filling meal. Also on the menu are tortilla chips, salsa and guacamole and a short drinks list including Margaritas (£4.35), Beer (£3.65 with Brooklyn, Modelo, Negra Modelo, Pacifico and Corona available) and a selection of soft drinks (from £1.15 to £2). I probably wouldn’t have thought to visit this fast food Mexican chain had I not been invited to learn more about tomatillos and how they are used in authentic Mexican Salsas. However, now that I’ve tried them, they are on my list of places I know I can grab a quick, tasty and filling meal. By the way, I genuinely love this recent Chipotle advertising video, called The Scarecrow, I came across it via Facebook. It’s twee, yes but I still think it’s wonderful! 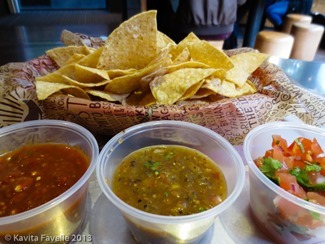 Kavey Eats dined as a guest of Chipotle Mexican Restaurant. 12 Comments to "Chipotle Mexican Grill, London"
There’s one near my work, I think I’m going to have to give it a try! It would be lovely if they added chilli con carne to the menu. All the toppings are already there – onion, sour cream, avocado :-)….. I do love a good chilli! Very regrettably we’ve never had a chance to to try Chipotle, either in Laaaaaandan or going across USA. I don’t think it’s ventured South yet, but I massively, enormously love the place. If you & Pete are ever up North I will glady buy you both a meal there so you can try it out. No plans for a visit up your way at the moment but would be lovely to meet. Thanks for the reco. 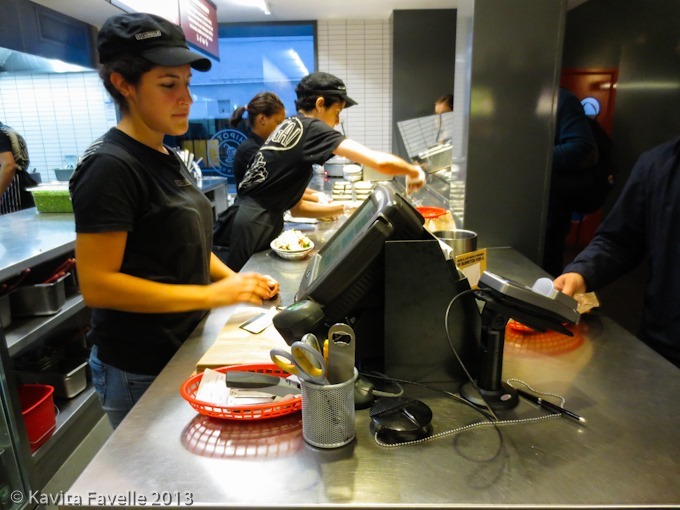 I love Chipotle, I was introduced to it in California a couple of years ago and was so excited when they opened a UK branch! I love that scarecrow trailer it’s so cute! It is cute! I hadn’t tried them in the US though I’d seen their brand there. Hope you enjoy it as much as your friends do!